You don't need a lot of equipment to surf with your dog! The following is a list of the basic things you'll need to surf with your dog. We've also included some other items you might want to take with you! We don't surf cats or rats, or pigs or llamas or goats or......! This is all about surfing with man's best friend! If you don’t already have a dog, please consider a rescue. 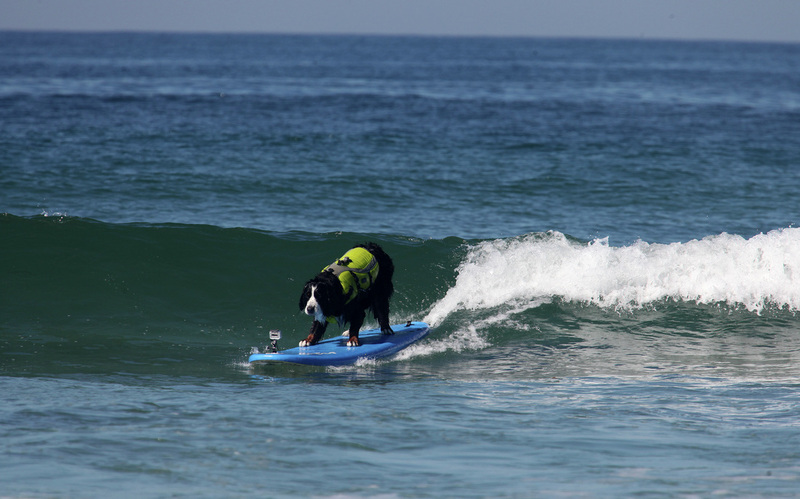 Several rescue dogs have become Surf Dog Champions! By the way, none of us had any idea we would be surfing with our dogs when we first got our dogs. Also known as a Pet Floatation Device (PFD), Life Jacket or Life Vest. This is the single most important item you can buy for you Surf Dog. Don’t go into the surf without one! Most all dogs can swim, some better than others. However, the ocean is not the same as a pool, lake or the bay. The waves are unpredictable and your Surf Dog will get tossed about. In a wipeout, your Surf Dog could be held down for awhile. Yes, your Surf Dog will wipeout! 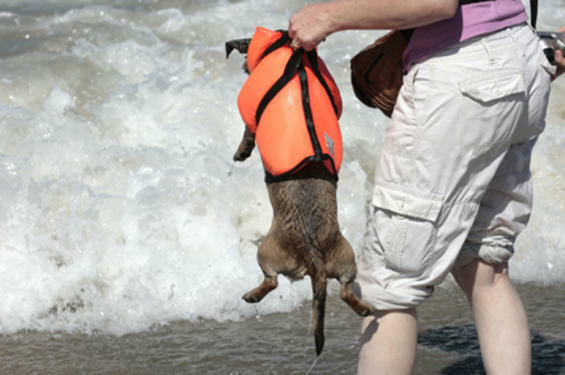 A CFD will help get your pooch back up to the surface after a wipeout quickly. Here's another good example of why you need a CFD! 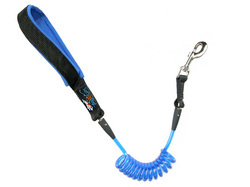 Most CFD’s have a handle which can help in retrieving you Surf Dog in an emergency. Your dog is not a piece of luggage! It’s not intended for carrying your dog! Resist this temptation. Yes you can pick them up by the handle, but don't do it! Pick up your dog by placing your hands under their chest or stomach! The CFD should be ‘snug fitting’ with no loose or extraneous strapping’s, hooks or buckles. 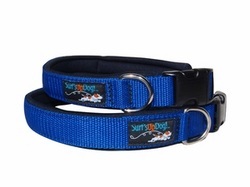 Try a few on before you purchase to see which fits your Surf Dog’s body shape and size the best! After you purchase it, put it on your Surf Dog and let them wear it around the house to get use to it. When you get to the beach, don’t put it on until you’re ready to hit the water. On a hot day, your Surf Dog could over heat! Don’t forget, to extend the life of your CFD, be sure to rinse it thoroughly when you get home. Salt water is the death of just about everything! There are a lot of choices for CFD's on the market. Click here or on the Swimming Dog (on the left) to see some of your choices along with links to their sites! If you’re just starting to surf with your dog, please find and use a Soft top surfboard. 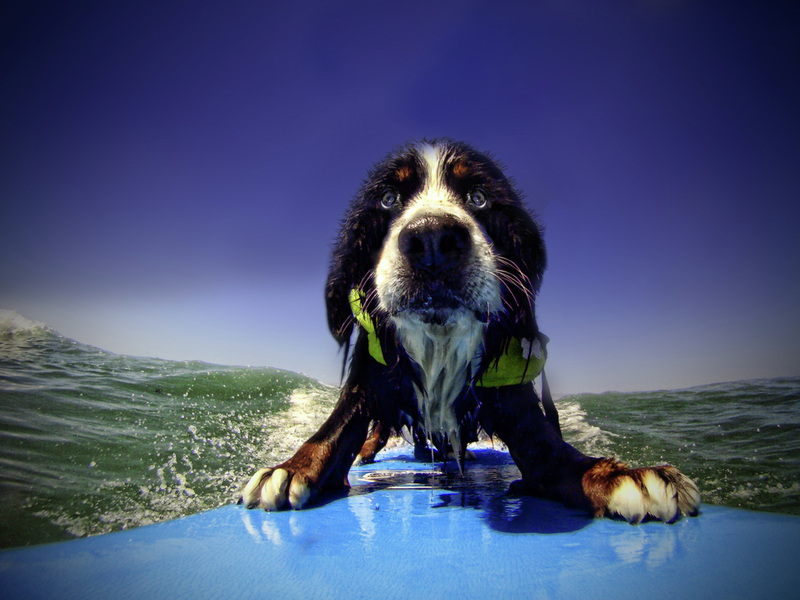 When you have mastered the art of surfing with your dog you can consider a fiberglass or epoxy surfboard. The fiberglass and epoxy surfboards that humans use are awesome for humans, much faster and have more control, but even with wax on the top they are too slippery for dogs and could seriously injure your Surf Dog when they slide off and get hit. Your Surf Dog’s little brain is already on overload with everything that’s going on around him so trying to stand on a slippery surfboard won’t help the situation! The soft top surfboards are also a little easier on the noggin if and when they get hit. 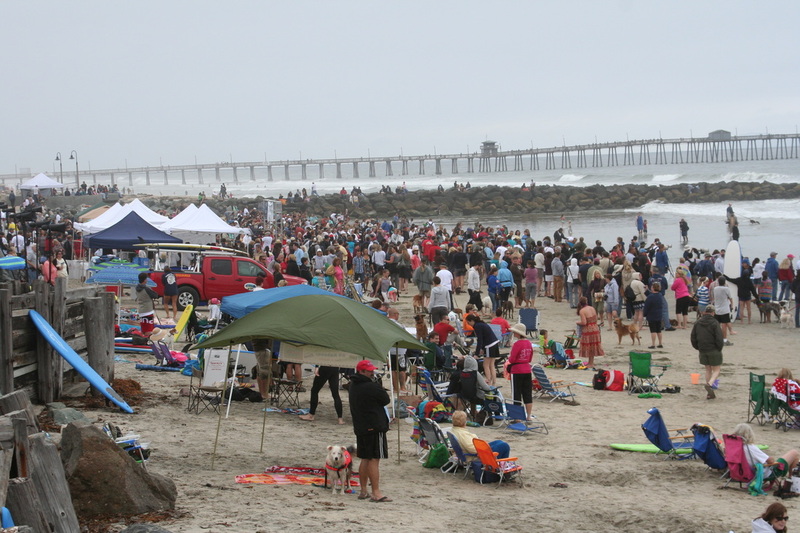 Most of the organized Surf Dog Competitions will only allow the use of soft top surfboards anyway. Might as well get one now! When you advance to become an expert Shredder, then a fiberglass or epoxy surfboard with the deck covered completely with a traction made might be a consideration. 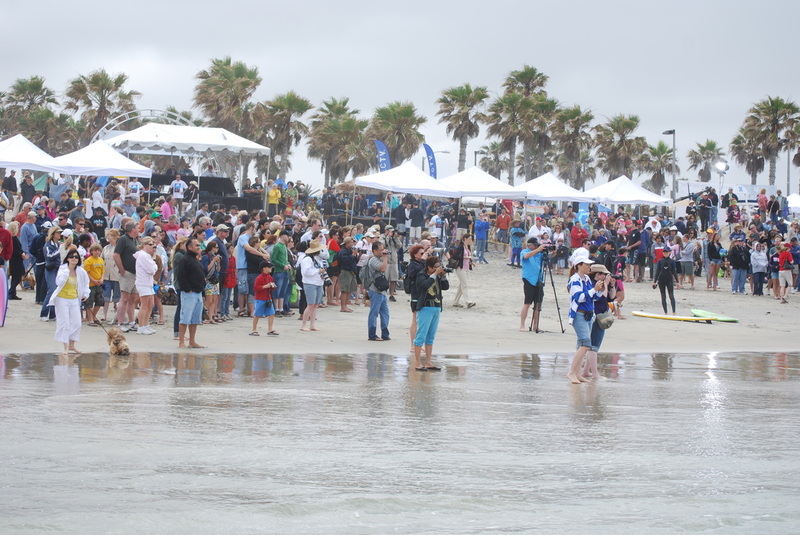 NOTE: Most SurfDog Competitions do not allow Fiberglass and Epoxy Surfboards!!! There are several soft top surfboard manufacturers out there including one that makes a soft top surfboard specifically for Surf Dogs! You can purchase a new one between $99.00 and $350.00 or you can go to Craig’s list or E-bay and find a new/used one for less! Click here or on Surf Dog 'Spike' to see a selection of surfboards! The top surface (deck) of some of the Soft Top surfboards and all fiberglass and epoxy surfboards will not provide enough traction to make your Surf Dog comfortable, so you may need to add a traction pad. Some Surf Dog Owners have added it only to the area they want their Surf Dog to stand like the photo on the left. Traction pad material is expensive so you might want to find a few people who need some and go in together. Lots of pattern’s and colors are available. Unless you have a vehicle and a small dog with a small surfboard, you’re going to need surfboard racks to get your surfboard to the beach. 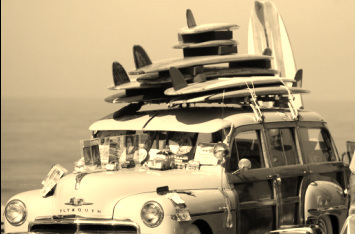 Most people just shove the surfboard in their vehicle with all the gear. Don’t do this if you can’t secure the board (you and/or your dog don’t want to get hit making a quick stop or evasive move) or if you don’t have good visibility. You’re better off putting it on top of the vehicle. Some vehicles come with built-in racks that work just fine. Go to REI or Home Depot and get a couple of tie down straps to secure your Surf Dogs Surfboards. These tie down straps are also available at your local surfboard shop. If you don’t have built-in racks you can get a pair of soft racks at you’re local Surfboard Shop. These are inexpensive and come with a bag for storage when not in use. They are made for vehicles with or without gutters. By far, the two most popular surfboard racks one the market are Thule and Yakima surfboard racks. Unfortunately they are also the most expensive. 'Inno' and 'Whispbar' are two other racks worth considering. All of the manufacturer’s make the correct fittings and accessories for most all Cars, SUVs, Truck and Vans on the market today. 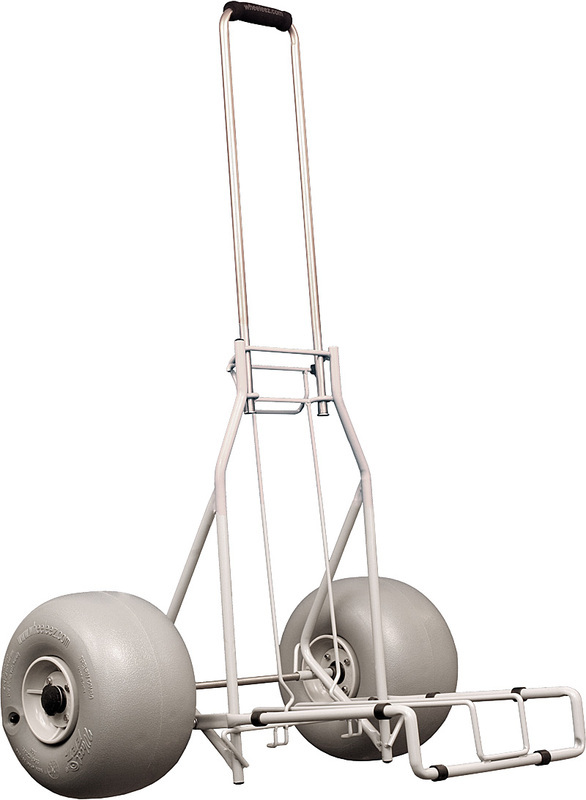 Some Automobile Manufacturers also make racks that are made specifically for their models. When you get home you’re going to want to stow your Surf Dogs Surfboards somewhere out of the way. Best solution is a wall or ceiling rack. There a re a lot to choose from. They are available at your local surf shop or you can check the links below. Click here or on the Surfboards racks on the left to see a few surfboard racks that are available for your vehicle and your home! 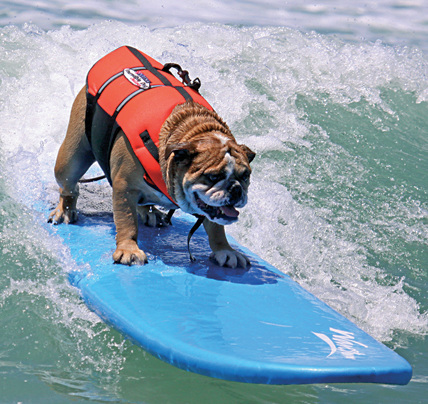 Your Surf Dog will spend a lot of time in and out of the water. Leave the fancy, expensive leather collars and leashes at home. You’re going to need a collar and leash that can take the abuse of the salt water and the sand. 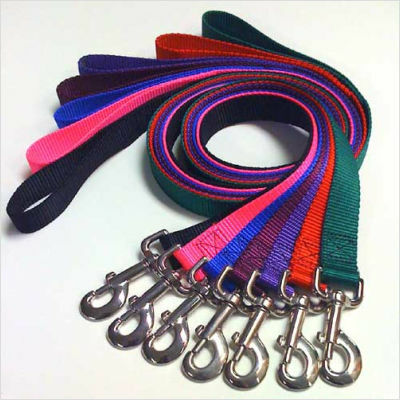 You don’t need to spend a lot of money on a “Beach Collar and Leash”. A good quality Nylon Collar and leash will suffice. When you get home be sure to rinse your surf Dogs collar and leash in fresh water and place somewhere out of the sun to dry. Checkout SurfsUpDog.com for collars and leashes made for the beach! 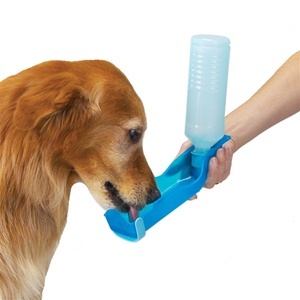 Your dog will get dehydrated at the beach. It doesn’t need to be a sunny day either. Be sure to bring a bowl and plenty of fresh water to refresh your surf Dog! 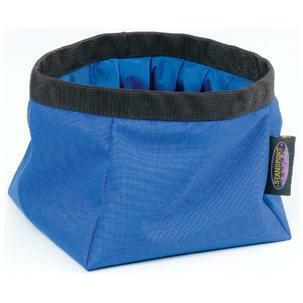 Collapsible bowls and plastic bottles with built-in bowls are available. 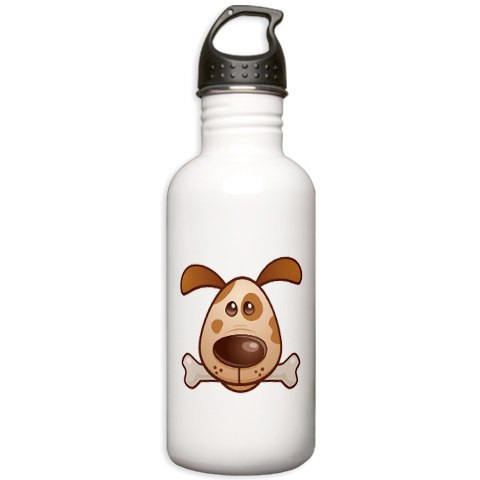 H2o4K9 (below) makes a cool 25oz stainless steel bottle with a cap that's a bowl. Neosling makes a handy sling to carry the H2O4K9 water bottle. H. Optional Items you may want to get. The previous Items are required to surf with your dog. The following Items are optional but you will find very useful. After a few times to the beach you’ll get the hang of what you really need to bring. You’re going to need something to bring all this gear in. 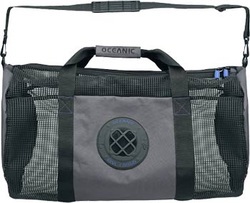 A light nylon tote, Back pack or duffel bag will do the trick. You can get a duffel bag at an army surplus store or you can spend more money and get a gear bag at a dive shop. 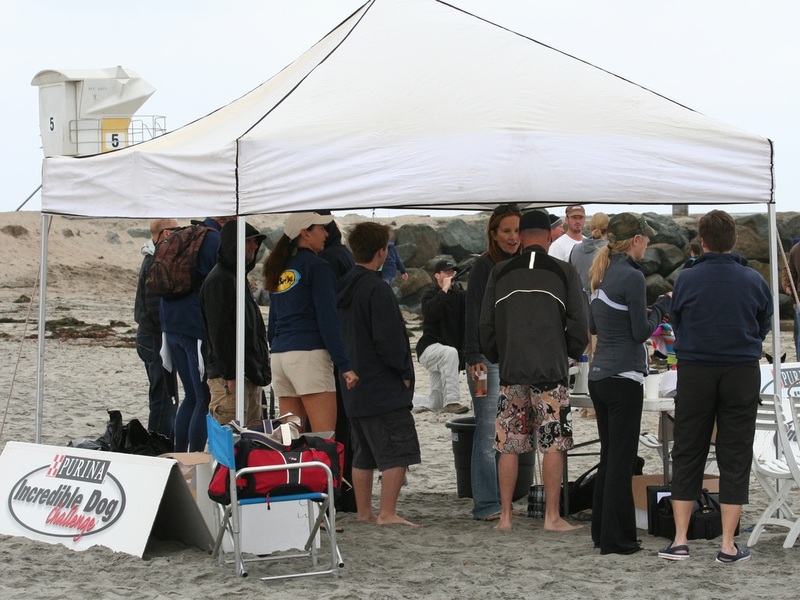 (One of our SoCal Surf Dog members even brings a 33 gallon trash bag to put her tote in while they are surfing. You’re going to get wet and so is your dog. It’s not always 80 degrees and beautiful at the beach. You’re going to be wet and cold and will to want to dry off and maybe even change into dry clothes. Bring a towel for you and one for your Surf Dog. Your Surf Dog is going to be wet and cold too. Nothing worse than you’re surf dog deciding to do the “dry off shake” inside you’re freshly cleaned car! Get him as dry as possible on the beach! Most dogs don’t care for the salt water and/or sand in their eyes either. Bring a separate small hand towel and some fresh, clean water to rinse and dry their eyes. You’ll be surprised how time flies when you’re having fun. Protect yourself from the sun’s UV rays while you’re at the beach. Invest in a quality rash guard. I prefer the long sleeve versions. A short sleeve and sleeveless versions are available as well. 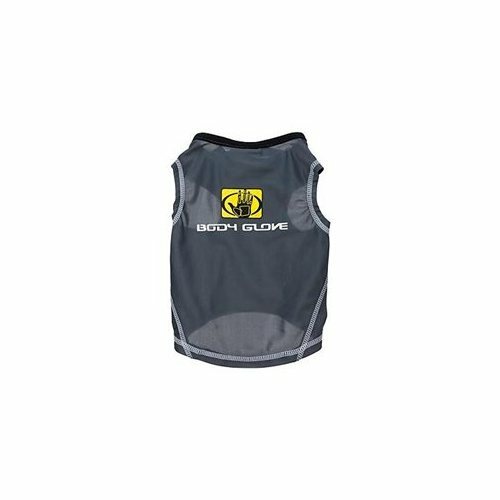 Experience has shown that a canine rash guard can help protect your Surf Dog as well. The lighter colored, short haired dogs need protection from the sun. 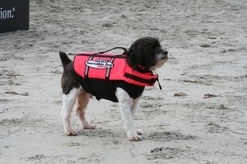 They can also help keep all our Surf Dog warmer by knocking down some of the cold wind. There are so many rash guards available, we're not even going to try to list them here. Just go to your local surf shop and try on a few. There are only a few months out of the year when the water and the air temperature are warm enough to wear just a bathing suit and a rash guard. For you, unless you really think you’re going to surf thru the winter, I suggest you just invest in a “Spring Suit”. With Short sleeves and short legs it’s typically all you need to stay warm. If you tend to always be on the cold side, a full winter suit might be in order. A full suit has both long sleeves and long legs. 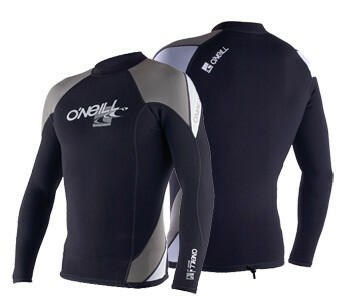 Wetsuits come in different thickness measured by millimeters (mm). Typically, the thicker the suit, the warmer it is. You might want to consider getting a pair of booties if your at all squeamish about what might be on the ocean floor. They might offer a little protection against a stingray hit, but only a little! The technology of wetsuit design is changing and getting better ever year! There are so many wetsuits out there to choose from, I suggest you go to your local surf shop and try on a few. 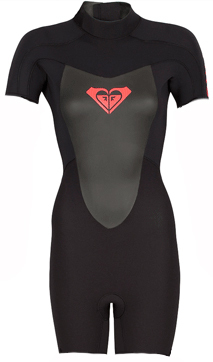 The Pros at a surf shop can help you select the correct wetsuit that firs your body style! You don't need gloves unless the water is colder than 54 degrees! You especially don't need webbed gloves unless the water is very cold and you're trying to paddle into some heavy surf or you're in a paddle board (Sprint) competition! 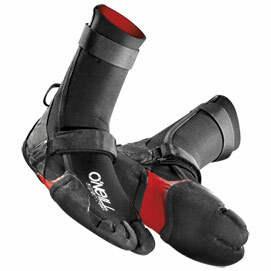 paddling gloves will hider your ability to grab your dog in an emergency! Think about it...do lifeguards wear them? Click on the gloves to see more. Be sure to get a wetsuit that fits correctly and comfortably. You don't want to look like this guy! Some Surf Dogs can and will get cold as well. 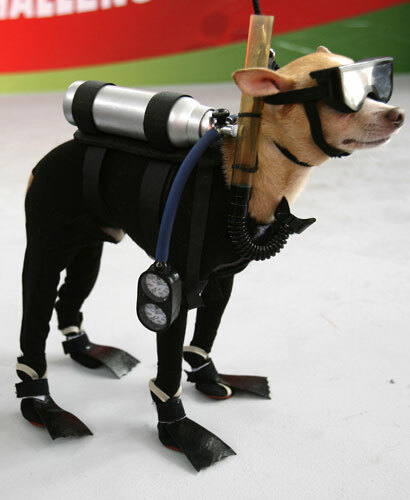 Some owners have had custom wetsuits made for their dogs. They wear them under their CFD’s. There aren't many available off the shelf, but Petco has one. I have had several wetsuits repaired here and she does a terrific job! You can also get a custom one at Lou's Doggie Boutique. Some dog owners think that because of their fur coats, dogs don't get sunburned. That's not true! Dogs do get sunburned and It's just as painful for them as for us. Your Surf Dogs can be sunburned on their noses, the tips of their ears, their stomachs and legs where their coats are thin or non-existent. Even animals that don't often roll over to expose their legs and stomachs may be burned from radiation being reflected off the sand. Dogs with light colored hair are particularly vulnerable. The first sign of dog sunburn is redness and tenderness on these parts. Sometimes, the edges of the dog's ears will become dry, cracked, or curling. In more serious cases, dog sunburn can lead to hair loss. Some of the chemicals that are included in human sunscreen can be dangerous for dogs. In particular, never use sunscreen that contains PABA on dogs, as this can be fatal if ingested. PABAs are not used in many modern sunscreens, but check the ingredient list just in case. Zinc oxide is also dangerous, as it can cause gastro-intestinal problems in some dogs if ingested. Use a sunscreen that is formulated for dogs, or one that is formulated for human babies. Avalon Organics Baby Natural Mineral Sunscreen, SPF 18 is a good one. The Epi-Pet Sun Protector Sunscreen Spray is currently the only FDA approved sunscreen for dogs. Make sure that the sunscreen is fragrance free, as this will reduce the amount of chemicals involved. It should be broad spectrum, meaning it blocks both UVA and UVB rays, as well as waterproof. The SPF should be 15 or higher. 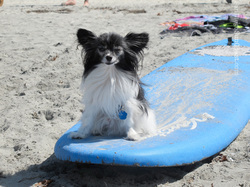 Some dogs need more motivation than others to get up and stay on the surfboard. 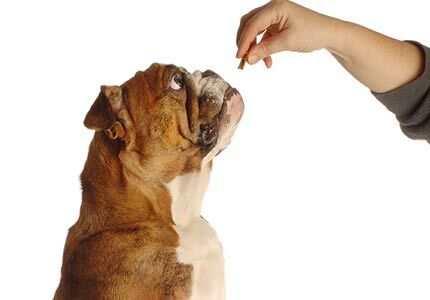 Bring your dogs favorite treats to help coax them up on to the board. Some SoCal Surf Dog Owners have had good success with canned cheese. Dogs love cheese! 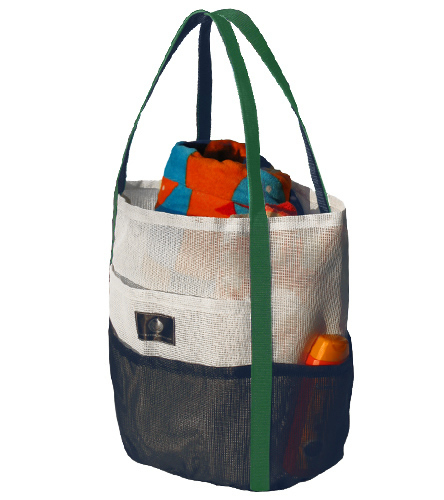 If you plan on staying at the beach a while longer, bring something for them to dibble on after your Surf Session . Be sure to bring plenty of water for your surf dog and you. You might want to bring an ice chest to keep your libations cool! If you plan to spend the day at the beach or you are participating in a Surf Dog Competition, you may want to bring some portable shade. 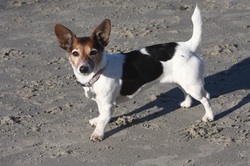 You and your Surf Dog are going to be in the sun for several hours and will need shade between heats. There are many umbrellas, Pop-up canopies, and shade tents on the market to choose from. Check your local sporting goods store! You may want to bring a folding chair as well. Some Dog Owners have found small igloo type tents specifically designed for dogs! 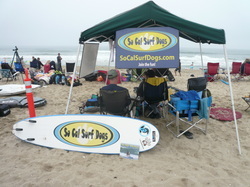 Some have used folding pens to confine their Surf Dogs between heats. As we have said before, after you've been to the beach surfing with your dog a few times, you'll get a better Idea of what You really need! You’re going to want to capture all of this because no one is going to believe you. A friend can stand on the beach and photograph or video your adventures but they will need a good telephoto lens. There are a lot of water proof digital still and video cameras out there for the adventurous that don’t mind standing in the water. GoPro makes a great little camera that is waterproof and takes photos or HD video. You can mount it to your surfboard with accessories they sell. Click on any of the cameras to go to their website for more information. Lots of different ways to use that waterproof camera when you get it! 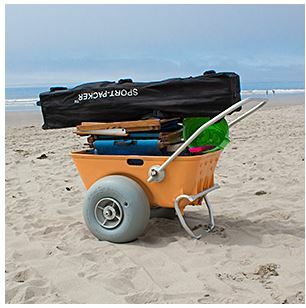 Now you need to get all that equipment down to the beach!